About: The Blue Posts is a friendly traditional pub that serves a selection of beers, wines, spirits, soft drinks and bar snacks. They have live Jazz fortnightly on a Thursday in addition to fruit machines, music, TV and a juke box. They also provide facilities for the disabled. Catering for private parties of up to 40 guests is available upon request. I can't say this is my favourite of Central London's Blue Posts pubs - I like the Berwick Street location - but it is a lovely traditional boozer. Dark, homely and friendly. A local in the heart of Chinatown. Nothing special but always good ales on tap and an unpretentious atmosphere. 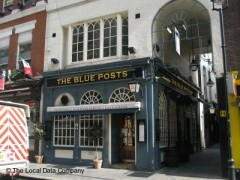 During a recent anniversary visit to London, we looked up the Blue Posts again having been to the Sunday music session a few years previously. Refreshingly, it's still there, and it's still an old-fashioned local pub in the heart of London. We went from 3.30pm until 8pm on a Sunday for the music and loved it. The live music, the staff and the atmosphere were all terrific, and the locals were all very friendly and welcoming. Well worth seeking out! Be quick if your going to visit this pub. "Not many more like it left in London now." A Warm, Welcoming and Friendly Atmosphere is assured. Have been here a few times and never been let down by any of the staff. Fred A. - Rayleigh, Essex. This pub has the friendly, cosy and relaxed atmosphere of a much loved local pub. It's our local although we live in Southend! Perfect place to people watch, beers are good and you must try the bar food...it's delicious. Guaranteed a warm welcome especially if the staff get to know your face. Cheers!